Sorry to be a little late with this series of posts, but, as we know, the NFL was on strike. This delayed free agency, which delayed teams from improving, doing nothing and some even from getting worse. These delays made it harder for me to accurately preview the NFL teams, and you readers had to suffer through life without my knowledge. Never fear guys, the Jobu’s Rum NFL Fantasy Preview Series is here.Let’s start first with the division that my New York Football Giants play in, The NFC East. As much as it pains me to say this, journalistic integrity leads me to pick the Philadelphia Eagles to finish first in the division. It does not, however, keep me from telling you how much I hate them. Offensively, the Eagles can help your team at every position. Quarterback Michael Vick has re focused on football, and is capable of putting up 3,500 yards passing and 800 to 1,000 yards rushing. LeSean McCoy is poised to have a breakout season, and will most likely top 1,000 yards rushing again. At receiver, they have one of the most explosive players in the NFL, DeSean Jackson. Vick’s other targets include speedster Jeremy Maclin and tight end Brent Celek. Their Defense should be pretty excellent this year too, with the additions of Nnamdi Asomugha and Dominique Rodgers-Cromartie to their secondary. This will help keep their points allowed down and their turnovers caused up. The improved secondary will also help them get to the quarterback more, so you can’t go wrong with their D either. My Prediction: 11 wins, first place in the East. Fantasy Notables: Michael Vick (although he will most likely miss some time with injuries), Jeremy Maclin, DeSean Jackson, LeSean McCoy, Brent Celek, the Defense. Fantasy Sleepers: Hard to pick, but if WR Steve Smith can get healthy he could be a very good possession receiver. that could help you out if your league is a PPR league. Fantasy Poison: No real poisons here, but make sure you have a quality backup QB if you draft Michael Vick. His aggressive, all-out style of play will probably cause him to miss a week or two. 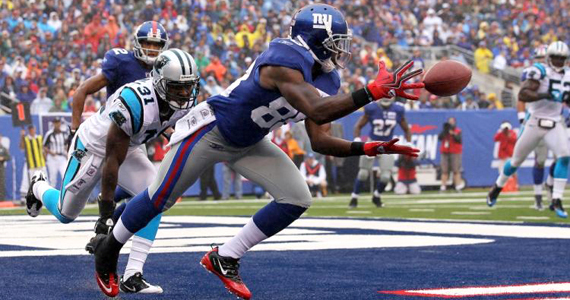 If the Giants are going to be successful in 2011, Hakeem Nicks will be a key. While the Eagles stacked up by adding quality players across the board, the Giants, to my chagrin, didn’t really make much of a splash at all during the free agency bonanza in late July and early August. They missed out on pretty much every key available free agent, and let Steve Smith and Kevin Boss walk away from their offense. That being said, they still have their two-headed running back monster, Bradshaw and Jacobs, and a couple of solid receivers in Mario Manningham and 2010’s breakout star Hakeem Nicks. Both of those guys could put up 1,000 yards this season. Even Eli Manning, who catches a lot of flack for being terrible, threw for over 4,000 yards and 30+ TDs last season. Not too shabby right? The Giants have a reputation of being a great defensive team. On the field, that reputation hasn’t been earned since Steve Spagnuolo left the team after their Super Bowl run. That being said, they still have a great pass rush, highlighted by Osi Umenyiora and Justin Tuck. They tried to improve their secondary in the draft by taking Prince Amukamara, but then he went and hurt himself in training camp… so it’s good that they didn’t even try to sign any defensive backs during free agency. My Prediction: 10 wins. Despite all the inactivity on the free agency market and the injuries, the Giants are still a solid all around team. Fantasy Notables: Eli Manning, Ahmad Bradshaw, Brandon Jacobs, Hakeem Nicks, Mario Manningham. Fantasy Sleepers: Travis Beckum. Eli Manning needs a tight end to step up as his safety net… can Travis Beckum fill the void left by the departing Kevin Boss? Fantasy Poison: I would stay away from the Giants Defense until they find someone to properly organize all that talent. 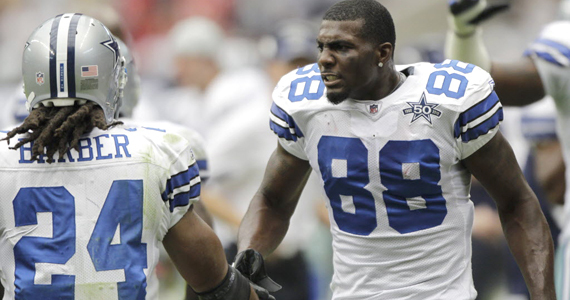 Is 2011 the year of Dez Bryant? Once again, the NFC East is pretty stacked. I’ve picked the Cowboys to finish third in the division, despite the fact that I think they have a chance for double digit wins this season. Offensively, Tony Romo is returning from the broken clavicle suffered at the hands of the division rival Giants last season (hee hee). He’ll return with plenty of weapons in his arsenal for 2011 too. Marion Barber is gone, which means the Felix Jones will finally get his chance to literally take the ball and run with it, and I suspect he will have a breakout year this season. Miles Austin had a bit of a letdown last season from his stellar 2009, but he still put up over 1,000 yards and seven TDs. I think he’ll bounce back, but 2011 is going to be the year of Dez Bryant. Look for him to break out in a huge way, if he can keep from being kicked out of shopping malls for wearing saggy pants. The Cowboys defense gave up the second most points per game in the league last year, and they haven’t done anything drastic enough to change that a lot, so they’re going to have to out-slug (baseball term) many of their opponents in order to win this year. That will hold them back slightly in 2011. My Prediction: 9 wins… no playoffs this year for Dallas. Fantasy Notables: Tony Romo, Felix Jones, Dez Bryant, Miles Austin, Jason Witten. Fantasy Sleeper: If Felix Jones gets hurt, and even if he doesn’t, Tashard Choice might soon be knocking on the door at running back. Fantasy Poison: That Dallas defense… too many points against, although their turnovers and sacks were solid last season. 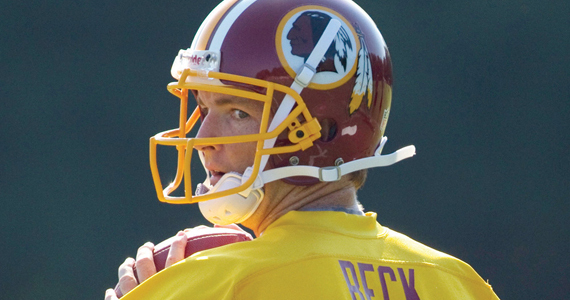 Can guitar legend Jeff Beck lead the Redskins to victory? Maybe, but this is QB John Beck. So… I guess all four teams in the division can’t be great. Someone has to finish last. As usual, it’s gonna be the Redskins. Guitar legend Jeff Beck takes the helm at QB this season in a stunning career choice… wait it’s not guitar legend Jeff Beck? Who the hell is J. Beck then? John Beck from BYU, you say? He’s starting? I’m sure their backup will have a chance to take over at some point then, right? Wait who’s their backup? Grossman? As in Rex Grossman?? From the Bears? Eek. Oh wait, at least they replaced Clinton Portis with a quality running back right? Oh… Tim Hightower… the guy who couldn’t hold off Beanie Wells in Arizona… Is Santana Moss still on the team? He is?? Isn’t he like 35? Oh he is… Oh… go Redskins! My Prediction: 4 wins… guitar legend Jeff Beck will figure it all out. Fantasy Sleepers: They’re all still asleep, but Ryan Torain could put up some solid numbers if Hightower gets injured or plays like he did last season. Fantasy Poison: Guitar legend Jeff Beck.. ahem… I mean QB John Beck. I can’t see him having any kind of positive impact this season. Also, everyone else not listed above.